In movie producer Sudo Tamegoro’s magical universe, decotoras rule and what fine leaders they make! The road clearly belongs to them and they use it for a lot more than racing each other dangerously. Decotora man Shuichiro does plenty of good: he travels around the nation not so much to deliver goods but ideas and to help those less fortunate who might literally trip under his truck, just as young Kosaku did in last year’s funny Decotora movie. Shuichiro, the loveable lead played by the fantastic Aikawa Show, is the kinda man we all wanna meet: he is polite, attentive, offers help and delivers the goods. Forget about just meeting him as he is not only nice but handsome and cool, and the only unsolved mystery in the Decotora movie series is why the women and maybe even some of the men for that matter, don’t fall for him. Beats me! He is the hero we are all waiting for to solve our family troubles, to feed us hot ramen when we are hungry and out of cash and even make us laugh while giving us some much needed food for thought. The producer, Mr. Sudo, comes off exactly like that type of man, gentle and funny, with hands that are capable of kneading dough while signing over movie deals, he has the type of reassuring control that attracts everyone to him. As many people told me in Asakusa, if Tame-chan, as he is affectionately known all over town, asks, they all want to help. I totally understand and feel the same way although we have yet to figure out what I could do for him. He is a typical good-natured shitamachi character, the guy we all want in our family. This is a man who in real life gets up at 5 am to bake bread till about 10 am, then runs around arranging the shooting schedule, begs money from sponsors and between meetings, even thinks of his tuna business. He is a jack-of-all-trades and if I were making a movie, his life story would play out even more in the lead. It does, in a sense as I guess Shuichiro’s character is very much based on Mr. Sudo’s personality. Speed is one trait this easygoing producer values highly and the whole film was shot in just 14 short days! Out of that Ishikawa san and I were there for 3 whole days and enjoyed every moment of it. The very first time I saw a decotora was many years ago in Ibaraki prefecture and I was immediately smitten. Yet although I have been in Japan for 12 years, I rarely saw these wheels of wonder. All that changed on October 3rd, 2004, when I was lucky to report for NHK TV on the hundreds of decotora gathered in Edogawa ward, Tokyo for a charity bash. I was stunned and immediately in love. Even though the term “falling in love” means losing control, I must say I didn’t mind. These amazingly loved and cared-for machines have souls and they are full of character, just like their owners. Decotoras are wonders of nature, the big brothers and sisters of the flickering lightning bugs, these illuminated UFOs travel effortlessly until they run out of steam and stop to recharge their weary bodies. Showing off so much requires a lot of energy! I guess the two main reasons I am so fascinated by these trucks is buried deep in my childhood. I was born and raised in Hungary where neon lights were few and at night the city of Budapest was covered in sleepy whispers and anxious expectation. But we did have some neon signs and even those few electronic wonders were enough to keep my great-grandmother and me in pregnant suspension. Deidi, who was born in the 1890’s, somewhere high in the snowcapped mountains of Slovakia, was forever fascinated by the flickering electronic signs. We often spent hours driving through the same streets in my mom’s tiny Fiat 850, with my great-grandmother and me cuddled up in childish amazement as the colorful signs brightened up our darkened universe. From those early days on not much changed in me, at night I still develop the same butterflies in my stomach and gravitate towards the brightly lit streets of Tokyo that offer more variety and quantity of neon signs than either Europe or the USA and here we even have decotoras! Dekotoras are the perfect combination of beauty, movement and sound. They exist for nothing more than giving pleasure to our senses with their amazingly altered bodies gracing the roads for all to enjoy. It is us, the viewers who can soak up the exquisiteness of decotoras, even if it is for just a fleeting moment when we are lucky enough to catch a glimpse of one driving by. Decotoras are art and their owners are all masters of their craft. Decotora owners are unselfish: they spend all their time and money fixing up something they can only see when they are not driving it, an idea that goes against the whole concept of having a truck. Why would you want one unless to head for the road and let it feel the highway and have its enormously stunning body have some fun? This is art humanized and although the drivers might still be after power and speed but the emphasis is on spirit, hence the paintings depicting gods and goddesses. Decotoras are a wonderful spectacle and we don’t need to buy a ticket to enjoy them. Thank you all, decotora owners! I guess one wants to take a decotora out for a walk, so to speak, to show it off and to share its beauty with others. Driving them slowly would do them more justice as we could enjoy their beautiful designs longer. I can tell you all that I love their look and if there is an otherworld, my great-grandma is definitely out there, scanning the road for a lit-up decotora. I saw plenty of giant trucks in the USA where I moved later on but they were more about size, power and endurance than decoration and cuteness. At that time I waitressed day and night to make ends meet and served omelettes and pancakes for tired truck drivers and cabbies in small local dives like Asakusa’s Maeda diner where Shunichi finds a warm meal and an understanding mom. Being there and watching the owner give up all control of her shop so the crew could take over, I realized how much this movie means to the people of Asakusa. Since I was a kid and was saved by a kind truck driver who drove me to a hospital after a terrible accident and most probably saved my life, I always respected truckers. I often imagine how tough their work schedule must be and how lonely they must feel driving around and I appreciate their efforts. When I drove around the USA, one of my all-time favorite places were the highway truck stops where the giant machines were resting outside while their drivers were busy inside nourishing their hunger with oversized meals and small talk with the waitresses that have seen it and heard it all. Shuichiro, the ultimate folk hero, is a perfect straight-up man and a younger and more handsome version of the super-popular Tora san. He is charming, helpful and ready to walk away from even the most beautiful girl because he knows there is always another one out there who needs his attention. Decotora movies are filled with average people making mistakes and trying to fix their lives. Moms abandon their kids and find happiness with a new man and child, while step-moms take care of their husband’s kids. In this cycle of give and take even if we are dealt a bad hand, we can still survive by relying on the kindness of others. When I arrived in Shimizu city around noon on a cloudy Sunday, I found the crew eating their lunchboxes on street benches. Director Katsuki, producer Higashida and the others were all welcoming and unpretentious, just like the typical Japanese people I love so much. No media arrogance here, only cool people who happen to be making a movie. As soon we said our hellos, it started to rain but the show had to go on and soon we were up filming a scene in which two actors, dressed in black suits and sporting darkened sunglasses, have a short but stimulating scene on top of the station walkway. Luckily we were under cover as the rain started to really pour. The crew worked with the outmost respect for the passerbyes which meant that filming a few second scene took quite a bit more time than I imagined it would as we had to wait for little kids and their moms to stop, play a little in the middle of the walkway, then start again, then an elderly gentlemen and a bunch of housewives came by and some of those stopped and started to discuss what the movie might be about and who the stars must be. The site of the trucks and stars triggered animated discussions and this type of scene was repeated several times in Asakusa, too. I realized how tough it was to make a movie, especially on a limited budget and filming it all outside in the city. Yet nobody got nervous or angry, the whole group was calm, polite and nice, like they were not in any hurry. I was humbled by their patience. They might be big shot stars on screen or behind the camera but they were as sweet as your best friend from high school, saying hello first to everyone around. Once this scene was done, we immediately took up our new position facing the road, where a car and some decorated trucks were making a left turn on the road, just behind the station. Since the street was not blocked, the crew had to wait for the perfect moment for the trucks to begin their move. Suddenly a family appeared and started across the street. Cut and wait for the next green light. By that time the rain was developing into a major storm. This scene was wrapped up quickly and soon we were driving to a hangar to film some indoor scenes. The crew had to wipe the trucks dry and set up lights but it only took them a few minutes and we were already rolling. Their efficiency was magnificent and the cuts were done in just a few takes. The few real-life decotoras present were generous with their time and energy as they patiently waited for the end of filming so they could go on working. As director Katsuki approved the cuts, the rain was already trying to pound holes into the roof and soon typhoon warnings were heard along the airwaves. Nature won and further shooting was postponed. Ishikawa san’s steady driving style assured our safe return and by the time we arrived back in Tokyo, we heard that both the shinkansen service and subway train services were stalled due to the heavy downpour. Luckily Ishikawa san was kind enough to drive me all the way home and we discussed how making a movie was tough but it must be even harder to drive a truck in such weather conditions. She was my real life decotora! A few days later we joined the crew again in Asakusa, inside the atmospheric Maeda diner. This area is Sudo producer’s home turf and he is definitely welcomed everywhere we went. I learnt my lesson in Shimizu and wore a teru-teru bozu necklace to ward off the rain and bring a lovely sunny day for our Asakusa filming. It worked! Before the scenes inside the diner we had time for a wonderful lunch. I love moviemaking, especially when it comes with great bentos! I had a chance to interview the actors, actresses and crew and will report back on that in the next issue. The next day we were inside the theater and taped many hilarious scenes. Ishikawa san and I, just as the rest of the staff, family and friends who were around and free, were all recruited to serve as extras for the audience. This movie was made on a shoestring budget so we all tried to contribute our best performance yet. The rehearsals were so funny that both us extras sitting in the audience and the crew were in stitches and because of our laughter, some scenes had to be retaken. Sorry! Once the actors were done, we extras began our scenes and now it was our turn to laugh as the cameramen and crew faced us from above the stage. Hmm, I was worried a bit but once we were given our cue, we all laughed our heads off. Laughter is contagious so it was easy to laugh with so many people, not to mention the great performance by one of the director’s assistants who acted out the scenes for us, alternating the roles between Shunichi and the others on stage. Stay tuned to the next installment of the dekotora saga. Till then, keep on trucking and always play it safe! 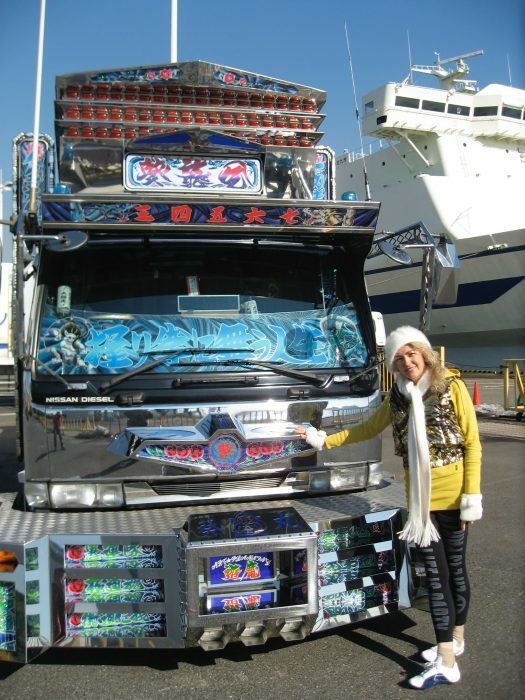 A bilingual version of Judit Kawaguchi’s dekotora article series appeared in the Japanese magazine Truck King. 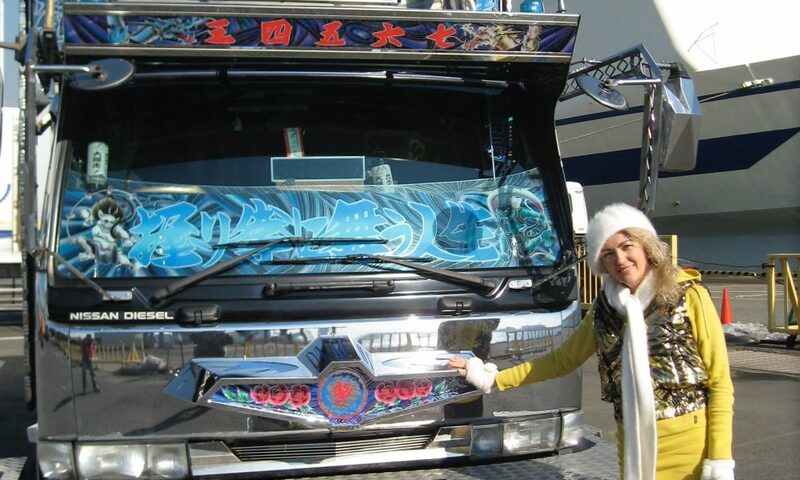 Reported at the shooting of “DECOTORA NO SHU – KOI NO HANA SAKU SHIMIZU KO” (Decorated Truck Driver Shu – Flower of Love Blossoming in Port of Shimizu).